This water bottle is an ideal hydration device for training, competition, and leisure use. Constructed with low-density, food-grade polyethylene, the Tyr Water Bottle resists the absorption of flavors and odors for refreshing taste quality time and time again. 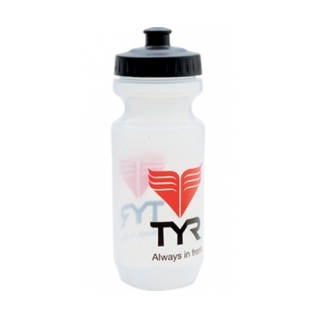 Showcasing a 21 oz, wide-mouth design, the TYR Water Bottle is the perfect go-to option for hydration. A large screw-top rubber valve allows for excellent water flow and food-grade, low-density polyethylene construction, combats the absorption of odors and flavors. Featuring a non-slip shape that fits in almost all cycling cages, jersey pockets and fanny packs.